A 32-year-old pregnant woman and her seven-year-old son have perished following a fire outbreak at the home. The sad incident happened on Tuesday evening at Ekye Amanfrom in the Afram Plains South District of Eastern Region. Report says another son of the deceased who was also burnt is in a critical condition at the Atibie Government Hospital where he’s receiving treatment. The cause of the fire outbreak is yet to be known—but sources say the husband of the deceased sells fuel and may have kept some quantity at home. 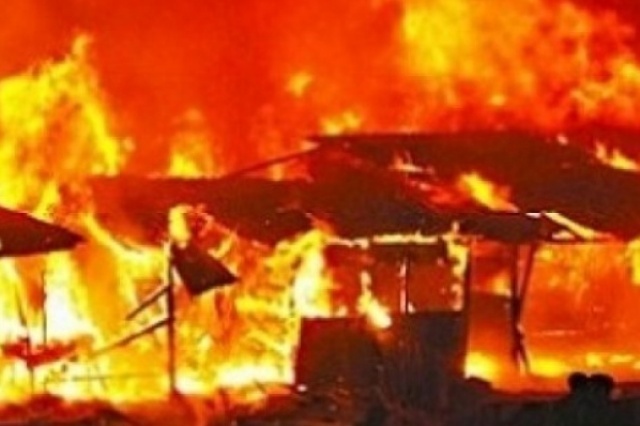 A resident told Agoo Fm’s Ebenezer Kojo Nyavor in a telephone interview that they heard a loud voice calling for help only for them to get to the location to see the house on fire. It took the intervention of residents to douse the fire. Police in the area were later at the scene to transport the charred bodies of the deceased to the morgue for further investigations to be conducted.